Not only is Ibiza renowned for its lively night club scene but the island also has a beautiful coastline and some romantic towns. San Antonio is where you will find the all-night party goers and non-stop fun. You will find cheap drinking places in the west end of the town including Cafe del Mar and Cafe Mambo as well as big resorts such as Ibiza Rocks. You will also enjoy some of the most beautiful sunsets on the island from the famous ‘sunset strip’. There is a small ferry from the town to the beautiful beaches of Cala Bassa and Cala Conta. Playa d’en Bossa is an area that, by day, boasts the longest beach on the island and is the place to go if you want endless sand, relaxing sun beds and bars with comfy chill out areas. At night, the area is home to some of the most known super clubs including Ushuaïa and Hï Ibiza which both attract A-list DJ’s. You will also find lovely places to eat and drink here and many restaurants have terraces on the seafront. Ibiza town is a cosmopolitan, yet grand and ancient, Mediterranean ci ty that is located on the south-east coast of the island. You will find everything that you expect of a city including great shopping, nightlife, restaurants and a good variety of bars and cafés. The city is divided into three different areas: the own town, the new town and the marina. The old town, as you could expect, is the old fishing area and the old port area where you will find cobbled streets and white painted houses and buildings. You will occasionally see a market here by night where you can pick up some local souvenirs. The harbour has been remodelled and now has a fresh feel with plenty of restaurants and bars. The New Town has a selection of big chain shops including Zara and Mango as well as smaller fashion outlets. You can find bars and restaurants located around the Plaza del Parque. The third area is the Marina. This area is more stylish and modern and so mega yachts and international designer shopping that call this area home. Many celebrities have holidayed here. Beaches are about a 15-minute walk away. There is also plenty of culture in the city which can be found in their archaeological museum as well as other public museums and art galleries around the city. You would be surprised how much history there is! 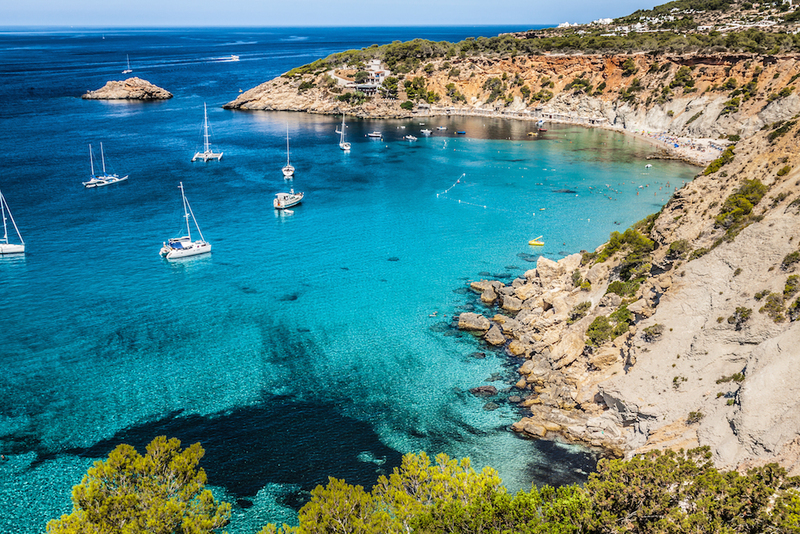 Cala Llonga is only ten minutes drive away from the famous Ibiza Town, but it has the most chilled-out atmosphere and makes you feel as if you are a world away from the island’s hectic club scene. It is a good resort for families as well as holidaymakers looking to explore the island away from the clubs and parties. Saying this, there is family entertainment and more relaxed bars and lounges for people looking to experience a small part of the nightlife that Ibiza has to offer. ChicRoom Barcelona has several holiday rentals in the small resort of Talamanca. This is one of the few resorts that is open all year round with its bars and restaurants to suit all budgets. Ibiza town is only a stroll away – 2km to be exact - but you are far enough away to enjoy long relaxing days in and out of season. If you wander down to the bay you will find that the waters are safe, shallow, clear and calm. There is a long wooden promenade along the cost that has plenty of restaurants and beach bars to enjoy a relaxing lunch or drinks throughout the day at the beach. We also are proud to present several lettings in Cala Jondal. Cala Jondal is often said to be one of the most stunning locations in Ibiza and definitely a must visit the beach. There are many beach bars at one end of the beach with young and trendy people whilst the beach is mainly occupied by families at the other end. It is a pebble beach but you will find that the few beach clubs on the beach have built up areas of sand for their guests. To the east of Cala Jondal, you will find the beach of Sa Caleta. It is a beautiful secluded beach surrounded by dramatic red cliffs. There are very clear and shallow waters here which make it a great spot for snorkelling and children. There is one restaurant here that is also called Sa Caleta and it is open all year round and full of local seafood. Cala d’Hort is another area where you are able to escape the party culture of the island and enjoy a day in this quiet retreat. The bay is hidden away in a National Park and has managed to keep all of its natural beauty without being subject to any mass tourism including huge hotels and noisy bars. If you want to find an idyllic spot looking over the mysterious island of Es Vedra, then this is the perfect place and you will also discover the real beauty of Ibiza. There are plenty of secluded and quiet bays on the island of Ibiza that are waiting to be explored!